Figure 8.9 Stratigraphic nomenclature for the Upper Cretaceous and Paleocene of Heilongjiang Province, northeastern China (column at right), showing correlations with the stratigraphically equivalent formations and members in the Russian Far East. The lower and upper contacts of the members of the revised Wuyun Formation are not defined lithostratigraphically (modified from Sun et al. 2002). Reprinted by permission. biostratigraphy, the K-T boundary would appear to lie below the Wuyun Formation and above the Yuliangzi Formation, i.e. within the Furao Formation (Figure 8.9). As noted, Liu (1983) had implied that the K-T boundary in Heilongjiang Province lies within the Furao Formation. Sun et al. (2002, 2004) proposed that the type area of the Furao Formation should be restudied because it may actually be composed of a lower part of latest Cretaceous age and an upper part of early Paleocene age. Sun et al. reasoned that the K-T boundary in the Heilongjiang area lies within an interval below the base of their Baishantou Member, in the uppermost part of the Furao Formation. 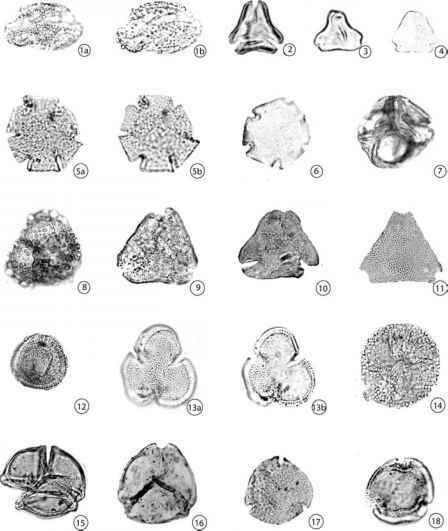 In 2004, Dr. Sun Ge of the Research Center of Paleontology and Stratigraphy, Jilin University, Changchun, collected six samples for palynological analysis from the Baishantou Member, which he sent to one of us (DJN) for analysis. Results confirmed an early Paleocene age for the leaf bed that contains the Tiliaephyllum tsagajanicum assemblage, although microfossil recovery from that bed was poor. Two samples from lower in the section yielded good palynomorph assemblages of early Paleocene age. Unfortunately, three samples from the Furao Formation below the tuff bed were barren, and the possible Late Cretaceous age of that interval could not be verified. Thus, the exact position of the K-T boundary in Heilongjiang Province remained to be determined. 2006 core, in which the goal was to locate the K-T boundary, verified the presence of the "K" in the lower part of the interval but not the "T" in the upper part. Heilongjiang River. At the current state of knowledge, however, sites that rely solely on palynological data and that lack geochronologic, magnetostratigraphic, or geochemical data must be regarded at best as potential K-T boundary sections. At present, the resolution of the K-T boundary in this region is at the stage level (see Section 2.1).